Just a few weeks ago, I got hit with the cold that lasted for 11 days. Luckily, I didn't have any sinus congestion, runny nose, stuffy nose, fever or headache. I only had yellow post nasal dripping which was either caused by a bacterial or viral infection. I started coughing out yellow phlegm 2 days later. My cold symptoms were relatively mild despite having yellow phlegm. I think I was over the cold in 7 days with 4 days of a lingering wet cough. By the twelve day, I stopped coughing and had no trace of residual yellow mucus. Seeing yellow phlegm gave me assurance that my immune system was doing its job. Yellow or green phlegm is the byproduct of the white blood cells doing its job to eliminate the infection. This is why eating healthy is so essential to maintaining a strong immune system to do its job when you have bugs inside of you. I have always taken the holistic approach to treating my cold. It's been well over 15 years since I took any over the counter cold medicine. I follow traditional Chinese medicine (TCM) method which includes using food to heal my cold. I've gotten great success using TCM to reduce the severity of my cold and speed up the recovery time. I once read that there are 137 Chinese prescriptions for the common cold. Imagine that. TCM is so much more specialized to treat specific symptoms which is why, in my opinion, is far more effective in you helping you beat the cold or flu. On the onset of my cold, which started off with a scratchy throat a few weeks ago, I didn't treat it right away because I got so busy planning my sister's birthday party. By the 2nd day, I started having yellow post nasal dripping. I quickly acted to reduce the damage that had already taken place. TCM explains that yellow mucus means there is heat in the body so I stayed clear of warming food such as garlic, ginger, onions, and spicy food for 3 days before including ginger and garlic in my food. Four days later, my symptoms were almost all gone except for some bits of yellow mucus and cough. 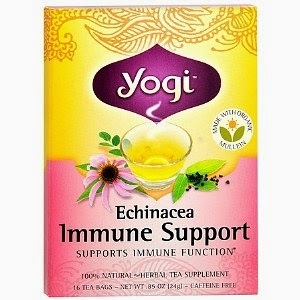 I saw Yogi Echinacea Immune Support Herbal Tea while grocery shopping and decided to give it try. Within a day of drinking this tea, it further helped clear the infection because my yellow mucus was starting to clear up. On the second day of drinking the tea, I had no more yellow mucus. I checked the ingredients for Yogi Echinacea Immune Support Herbal Tea supplement and found besides echinacea, an immune system booster herb, elderberry was another ingredient in the tea. In many clinical studies, elderberry has been found to have anti-bacterial and anti-viral properties that help stimulate the immune system. This tea has 2 great herbs and I ended up buying 3 boxes of them afterward. Besides eating healthy, I found drinking the herbal tea significantly helped speed up my healing time. For some people, a wet cough with yellow or green mucus can linger on for 2-3 weeks or even longer. I was glad I got over the cold in less than 2 weeks. A word of caution about Yogi Echinacea tea that I experienced myself. Since echinacea and elderberry are cooling herbs, after my mucus cleared up, I stopped drinking it because my lungs were starting to feel cold. I would not drink this tea if I had body chills or aversion to cold. In this case, I would boil ginger and orange peel to try to sweat out my cold. Trust me. This method works very effectively to greatly reduce your cold symptoms and get you back on your feet in a couple of days as opposed to a couple of weeks.